So you just met your friends, went to the pub and started quenching your thirst. The evening goes great until you realize you left your phone at home. Oh no, your antennae are cut off from the world! How are you going to show them that excellent photo you made of a spider eating a small dog? You were bragging about it for ten minutes and now the crowd demands proof. Not to mention that not having that 4G brick nearby makes you feel a little handicapped. Luckily you have AirDroid installed and one of your pals draws his tablet and invites you to access your phone through it. The evening is saved! Although your credibility might not be. It seems today that more and more software leaves the steady local hard drive and soars to the internet taking the form of web pages. AirDroid is such an application. 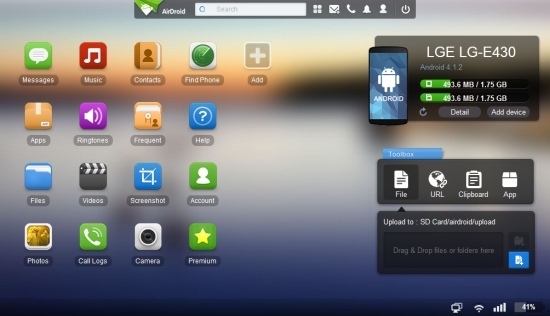 At its heart, AirDroid functions like a mobile device manager but its form allows it to perform an extraordinary feat. It allows you to access your data independently of the device’s location on Earth (or as far as 4G data connection goes into the ionosphere). It works like this. You install the Android app on your phone and make an account. You then turn to the computer and log into the AirDroid web site. Voila, your computer (well, not necessarily yours) can now send and receive files from and to the phone, read the contacts list, initiate calls, read and send text messages. The web interface is organized like a computer workspace. It has icons for Messages, Call Logs, Photos, Files etcetera. It has a task bar and even features 4 workspaces in case you run out of… workspace. Apps are treated like any other file. You can download from the device, upload new ones or delete existing ones. Contacts are well managed and can be edited with every detail (except for their pictures). 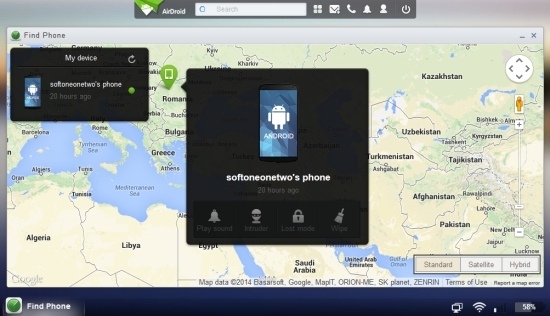 AirDroid also has a special feature just in case you leave your phone under the pillow. Find Phone brings up Google Maps and shows your current phone location. I know, it’s of no help telling you the street because you already know it’s in your room. But Find Phone has a button that forces it to play a sound (even if it’s muted). But in case you DO care what street your phone ended up on then Find Phone has three more buttons. “Lost mode”ows you to set up a number password on your phone and make it display a message for the one who finds it. “Wipe”etes all the data and resets the phone to its original factory settings. Pretty brutal, but don’t worry, it will ask for a password confirmation in case you click it by mistake. “Intruder”a nifty function if you’re bent on finding the culprit yourself and deliver justice while reclaiming your prized possession. But this is a premium feature that only comes with the paid service. Who said that being a vigilante was free? As far as Find Phone goes, if you don’t usually keep your device connected to the internet then you’ll have obstacles to using that feature. But when you do connect it then you’ll have the smoothest experience of transferring files and managing apps. You may get a sense of paranoia seeing you phone data on a foreign computer but rest assured, most apps can access it also. AirDroid is a joy to use and despite the lack of a backup function, it has everything you need to professionally manage your data in a clear manner and without unnecessary rings and bells. Kudos to SAND STUDIO!